Indigenous (In)Justice: Human Rights Law and Bedouin Arabs in the Naqab/Negev, edited by Ahmad Amara, Ismael Abu-Saad, and Oren Yiftachel. Cambridge, MA: Harvard University Press, 2013. 348 pages. Bibliography to p. 318. Afterword to p. 327. Contributors to p. 334. $26.00 paper. 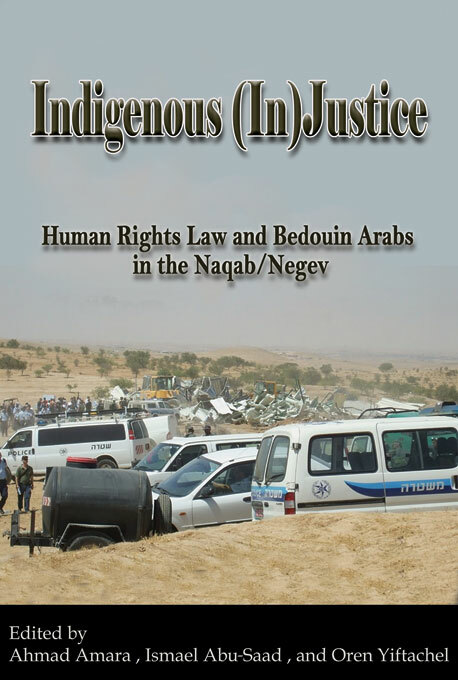 The volume Indigenous (In)Justice: Human Rights Law and Bedouin Arabs in the Naqab/Negev, edited by Ahmad Amara, Ismael Abu-Saad, and Oren Yiftachel, attempts to deepen our understanding of the dynamics of settler indigenous relations as well as the Palestinian bedouin community from the Naqab by reading these two subjects of inquiry against one another. Yiftachel [*] and Abu-Saad are among the leading scholars investigating the Naqab bedouin subject, from the disciplines of geography and educational policy, respectively. Amara, a doctoral candidate in Hebrew and Judaic studies, has also made noteworthy contributions to the field. Indigenous (In)Justice was published by Harvard Law School’s International Human Rights Clinic, a program designed to train students in human rights lawyering and its practical components. In that empirical spirit, members of the Clinic research team made an official submission to the Israeli government-appointed Goldberg Commission, which was tasked with proposing solutions to the Naqab bedouin community’s pending land claims and place of residence (p. 7). The book explores a number of interesting angles on indigeneity—on its contested meanings, case and statutory law, and victories and shortcomings of the indigenous justice movement. The volume outlines how the colonial claim of terra nullius has largely been refuted, citing an advisory opinion of the International Court of Justice on the Western Sahara, as well as case law in Africa, Australia, and North America. These cases have concluded that colonial powers did not acquire sovereignty or original title over land by simply occupying it; rather, because there was a self-organizing indigenous society in existence prior to their arrival, colonial governments were compelled to recognize indigenous rights, negotiate with those populations over land use, and rectify past injustices through appropriate compensation schemes (chapters 4–7). By sketching advances in jurisprudence on indigenous issues internationally, the book illustrates how Israel fails miserably to uphold similar standards regarding the Naqab bedouin. Israel refuses to recognize Palestinian bedouin as indigenous, and has considered the land which they have used, possessed, or occupied for centuries as being mawat or terra nullius. The articles by Amara and Zinaida Miller, Noa Kram, and Amara and Rodolfo Stavenhagen (chapters 2, 3, and 4, respectively) demonstrate how the courts systematically undervalue indigenous ways of being and doing through seemingly arbitrary evidentiary and procedural rules in land cases, and contrary to the practice of earlier sovereigns, the Ottoman and British. In chapter 5, Rashida Manjoo, the UN special rapporteur on violence against women, offers a nuanced account of the intersections between violations of the right to adequate housing and violence against women within an international human rights law framework. John Sheehan’s contribution (chapter 6) was possibly the most intriguing. In addition to demonstrating the spiritual underpinnings and practices of individual (and not just common) holding in indigenous property law, Sheehan challenges the reasoning and methodologies of common law property itself. In deconstructing epistemology, Sheehan accomplishes what the book as a whole struggles to do. He provides analysis, grounded in indigenous theory, to a volume that is largely descriptive and often argues along the binary of colonizer versus colonized. Although Yiftachel outlines theoretical tracks of inquiry “for future research” (p. 309), such as co-optation of natives in colonial rule and intracommunity contestations of identity, this regrettably comes at the tail end of the book and is not its preliminary point of inquiry. [**] In this way, the volume falls short on two principal fronts— not questioning the epistemology around the Naqab bedouin subject and failing to draw on theory common to the study of settler/indigenous relations. An explicit example of the dilemmas of being unhinged from theory can be found in the phrase, “Parents have hesitated to send their daughters to receive these [mental health] services because of the ‘stigma’ that adversely ‘affects their chances of getting married in the future’” (p. 52). It is unclear whether this censure is a cultural practice or owing to some other concern. Either way, how prevalent is it? And if “cultural,” what shapes this particular practice? Is it just some Arab/Muslim/bedouin idiosyncrasy, or is it indeed shaped by a coalescing of a plethora of factors given the community’s situatedness? Certainly, analysis that attempts to read social phenomena through an indigenous/(post)colonial theoretical lens cannot afford to simply state this as fact, for to do so would risk carrying the charge of cultural determinism. Rather, it ought to take the pains to undertake the phrase’s deconstruction as per the demands and practice of the respective theories. The theoretical frameworks cited have proliferated for decades, though there may be very valid reasons for their absence in this volume. One such explanation can be found in a recent volume that does deconstruct received knowledge on the subject, The Naqab Bedouin and Colonialism: New Perspectives (Routledge, 2014). The book’s opening chapter neatly deconstructs how the Naqab bedouin subject came to be, as a product of inquiries by missionary scholars, Mandatory authorities, and later the colonial Israeli state. The book argues that research has overwhelmingly tended to be reductionist, culturally deterministic, and encompassed in modernization theory, pitting the primitive bedouin against the modern Israeli state. Today’s scholarship—and I see Indigenous (In)Justice as an example—tends to show how the bedouin are marginalized actors, though effecting agency. However, this line has not been able to shake off the shackles of antecedent scholarship. Consequently, it implicitly perpetuates a modernization teleology and/or Manichean dichotomy, where yesterday’s antagonists are today’s heroes, with little nuance in between. [***] I should point out that this work (and others like it) may have been unable to shake off received knowledge on the subject because of institutional pressures at Ben-Gurion University of the Negev (BGU), which is widely acknowledged as the academic center for Naqab bedouin studies, and where editors Yiftachel and Abu-Saad are full-time faculty. Following a 2004 international conference at BGU that Abu-Saad coordinated, and which framed bedouin education and empowerment in indigenous terms, university officials were less than pleased and undertook measures to mitigate the possibility of a similar endeavor recurring. In 2011, an international committee review of the university’s political science department raised concerns that faculty were unbalanced—too left-leaning, interdisciplinary, and embedded in political activism. Following this, the government’s Council for Higher Education took a decision to shut down BGU’s Department of Politics and Government, though it later backtracked. Minus the odd instance, the book presents facts accurately. Aside from the repetitive elements in the first half of the book concerning background information detailing the community’s marginalization, discriminatory legislation, and arbitrary actions of Israeli administrative bodies, the book as a whole is a welcome contribution and will be beneficial for novices as well as experienced researchers in the fields of indigenous and Naqab bedouin studies. Nasser Rego, doctoral candidate in law at Osgoode Hall Law School, York University, explores the issues of agency, performativity, and recognition in his research on Naqab Palestinians’ interactions with Israeli law. * It is worth noting that Yiftachel has made significant contributions to political geography and urban planning in Israel/Palestine more generally, most notably with his publication Ethnocracy: Land and Identity Politics in Israel/Palestine (Philadelphia, PA: University of Pennsylvania Press, 2006). ** Amara and Miller also acknowledge that “the system” is indeterminate, though specifically how those contestations and negotiations manifest in colonial governmentality is not explored (p. 113). † Lewis R. Gordon, “Du Bois’s Humanistic Philosophy of Human Sciences,” Annals of the American Academy of Political and Social Science 568, no. 1 (2000): p. 275. ‡ As explored in Elizabeth A. Povinelli, The Cunning of Recognition: Indigenous Alterities and the Making of Australian Multiculturalism (Durham, NC: Duke University Press, 2002); and, Patchen Markell, Bound by Recognition (Princeton, NJ: Princeton University Press, 2003). *** Mansour Nasasra, et al., The Naqab Bedouin and Colonialism: New Perspectives (New York: Routledge, 2014), pp. 8–11.